Ok, so I have been building a media centre for about a week now, and I have had a lot of trouble getting it setup and working right, but now XBMC has released version 9.11 alpha 1 version of its popular media centre software which is now compatible with Ubuntu 9.10. After all the trouble I had, I thought I would share with you how I installed it, and got XBMC to boot on load. I am using an ASUS AT3N7A-I with a 1.6 dual core atom processor and NVidia ION chipset, 2GB of ram and a 1TB hard drive. So I will only be showing you how to use the NVidia drivers for linux, but to be honest NVidia driver support for linux is better than ATI support. Download either the x86 or x64 version dependent on your hardware. Once the disk image has downloaded either burn it to CD or use UNetbootin to boot from a USB pen drive. Reboot the computer you wish to install xbmc on, and boot from the CD or USB pen drive, you may need to change some settings in your bios to boot from CD or USB. Start the installation, and follow the onscreen instructions to set your language and keyboard layout. Enter a username and password for your main account, for this I entered xbmc. The installer will ask you what packages to install, scroll down to OpenSSH Server and press SPACE, then press ENTER to continue. After the installation has completed, your computer will reboot. When you get to the login screen, login with the username and password you entered. Once you have logged in we need to add the PPA for XBMC. And these lines to the end. We will need to add the a key to aptitude to stop it complaining. Now we need to update aptitude. Next, we want sound for our media, so we will install some sound drivers. Your user needs to be added to the sound group. Change xbmc to the username that you entered. The sound level will be set to zero, to change the volumes we need to enter the sound mixer. Use you up and down keys and set the volumes to the maximum they will go. Press the right key until you get to IEC958, EC958 D, EC958 1 and press M on each of them to un-mute them. Press ESC to quit out of the mixer. To make alsa save the volumes run. Now we can install XBMC. This will install xbmc, all the skins and eventclients. Again you will have have to change –user xbmc to the username that you entered in the installation. Now the last thing to do is make XBMC launch at startup. This next step is OPTIONAL, to hide all the information about what is being loaded, we shall install a usplash boot screen. When the computer restarts, you should see the splash screen you selected, and XBMC should boot up. And that’s it, you should have a fully functional media centre running the latest version of Ubuntu and XBMC. As this is an alpha version, you will need to perform some updates now and again until the final release is out. Thanks to jonassw from XBMC forums, who suggested using the latest version of the NVidia drivers. The following command adds Medibuntu’s repository to Ubuntu. It also adds Medibuntu’s GPG key to your keyring, which is needed to authenticate the Medibuntu packages. Click here and Follow the steps to add medibuntu repostories to ubuntu 9.10 karmic Koala in my previous post. PlayOnLinux is a piece of sofware which allows you to easily install and use numerous games and softwares designed to run with Microsoft®’s Windows®. Cairo-Dock is an animated application launch bar for the desktop, comparable to the dock in Mac OS X or Rocket Dock (for Windows). It is compatible with Compiz, but it can also run without a composite manager . Cairo-Dock can run under GNOME, KDE and XFCE. Screenlets are small owner-drawn applications that can be described as “the virtual representation of things lying/standing around on your desk”. Sticknotes, clocks, rulers, … the possibilities are endless. The goal of the Screenlets base-classes is to simplify the creation of fully themeable mini-apps that each solve basic desktop-work-related needs and generally improve the usability and eye-candy of the modern composited Linux-desktop. – Moovida Media center : Moovida is much more than a simple media player… it is a cutting edge media center bringing the best of the internet to your TV screen. Automatically creating your own digital library you can browse from your sofa with a remote control. The elegant and easy to use interface automatically displays artwork and fan art throughtout and gives you access to movie synopsis and artist info. 10 Essential Applications For Ubuntu 9.10 Karmic Koala… – Just another useless weblog! Originally posted here! ___ Hai, Ever since Ubuntu’s (+all of it’s variants) latest version, 9.10 ‘Karmic Koala‘, was released people seem to be. 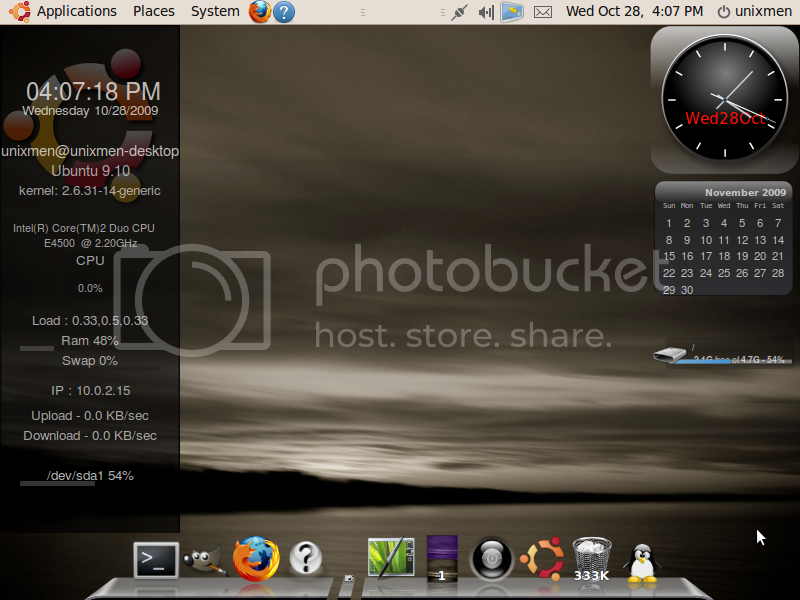 The dual panel Nautilus which previously was only available for Ubuntu Jaunty is now available for Ubuntu Karmic Koala. Thanks to the author’s comment, I kept checking to see when Karmic packages were finally available and it didn’t took long until he finally build them. You can add the PPA instead of just downloading the files, if you wish. You will also find Jaunty packages in the PPA. Then press F3 to open the second panel in Nautilus or via the menu. then navigate to apps/nautilus/preferences and enable the option called start_with_extra_pane. I have not tried a text install, nor do I know how. And I was using Live KDE cds before 11.2 came out. And the last two KDE 4.3.2 & 4.3.3 didnt work due to the error that I linked to. So I doubt the live cd would help. It is not much of a secret that the launch of Ubuntu 9.10 aka Karmic Koala has not gone quite as smoothly as Canonical Ltd would have hoped, however developments are slowly being made which are beginning to help rectify some of the most annoying issues associated with the release. Following all of the responses regarding my previous ‘Ubuntu 9.10 (Karmic Koala): Are You Experiencing Problems?‘ article I thought I would scour the web for fixes that may help out some of our readers. The first fix I have found relates to a popping noise which is experienced with some Intel HDA (high-definition) audio chipsets, this fix was originally posted on YouTube by a user called “shmalignant“, the fix is pretty simple, rather than explain it myself I have embedded the video below, heres the direct link to the video. I must just add that although there are no likely problems associated with this fix, if you choose to attempt the fix it is at your own risk (editing this particular .conf file shouldn’t cause problems.